Purchasing Administrators handle the purchasing programs that guide the procurement activities. The job description entails performing varied administrative tasks ranging from reviewing purchase requests to partnering with vendors. 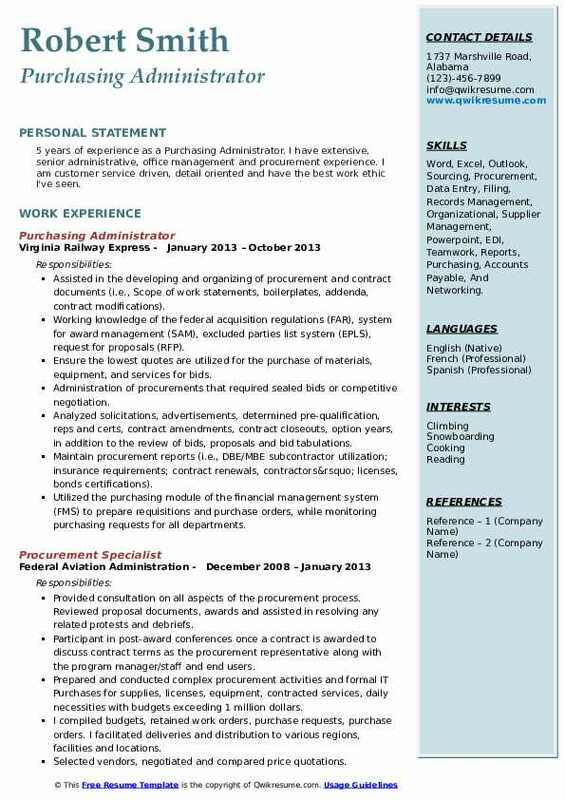 The following are some of the job tasks that are mentioned on the Purchasing Administrator Resume – directing and managing the operations of the buyer, assistant buyers and other purchasing department staff; conducting a research of vendors and suppliers, ensuring that the purchased items are delivered on time and that payment is made in a timely manner; making purchasing contracts with supplying companies and analyzing and predicting the market to see if the products can be sold or not. 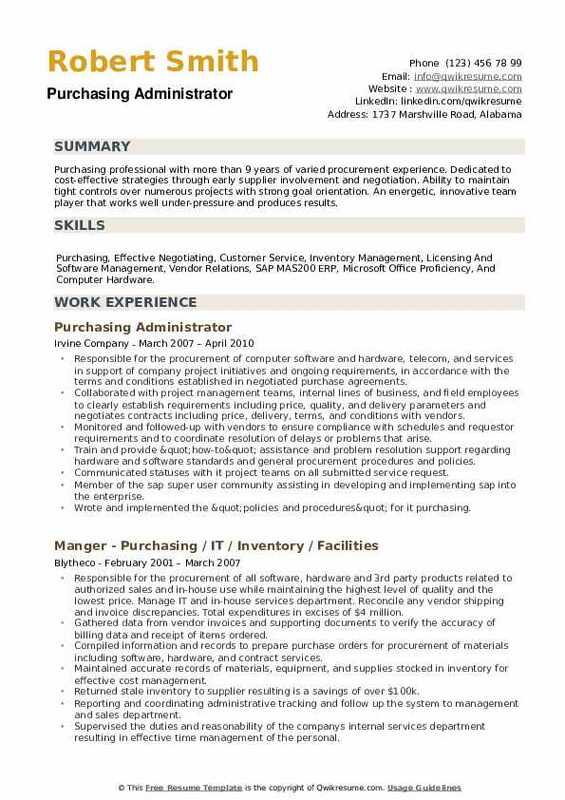 To take this crucial post of managing the Purchases, the job applicant should possess a good understanding of supply chain procedures, have a hands-on experience with purchasing software, gain advanced knowledge of MS Excel, have a thorough understanding of market research and possess solid negotiation skills. 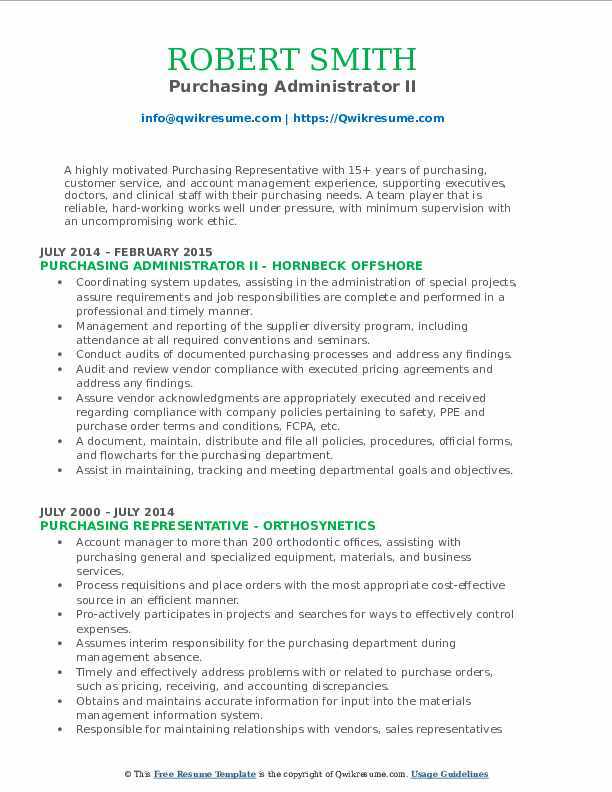 To become a Purchasing Administrator, one needs to earn a degree in business management or economics or accounting. Summary : A results-driven professional with over 10 years of experience as a Purchasing Administrator in client-facing, high-volume environments requiring expert communication, analytical, problem-solving, and organizational skills. Successful in Business Analyst and Purchasing Administrator roles. Skills : Research & Analysis, Requirements Gathering, Business Process Improvement, Risk Assessment, SDLC, Testing, Quality Assurance, Reporting, Training, Policy Administration, Documentation, Production Support, Customer Service, Systems Analysis, Relationship Management, Life Insurance /Annuity Subject Matter Expertise, MS Office Suite, Sharepoint, JIRA, Adobe Acrobat Professional, Visio, Platforms: Windows, And Mainframe. Enthusiastic resource for 175+ locations nationwide, assisting in the procurement of goods and services, for corporate offices and clubs alike. Responsible for streamlining the uniform order process, removing the middleman and reducing delivery times from 4-6 week down to 1-2. 5 weeks. A smooth transition of over 20 acquired clubs to TSI approved vendors. Meeting with vendors to discuss cost-saving opportunities and streamline the process for securing services and products. Maintaining a strong working relationship with vendors, as well as strong internal relationships within various departments. Investigating and resolving any non-financial vendor issues in a timely fashion. Monitoring supplier performance and provide feedback to the director of purchasing. Processing supply orders for all departments, confirm deliveries and distribute accordingly. Ensuring ample stock to fulfill orders, requesting additional supply when needed. Creating purchase orders, monitoring prompt progress through all stages. Providing support to technicians, ensuring possession of tools required to maintain club equipment in working order. Maintaining current records of vehicles and drivers in a fleet, including maintenance, insurance claims, tickets, etc. Working with fire safety companies to ensure devices up to code and in good working condition. Providing approvals to address deficiencies and repairs of fire safety devices. 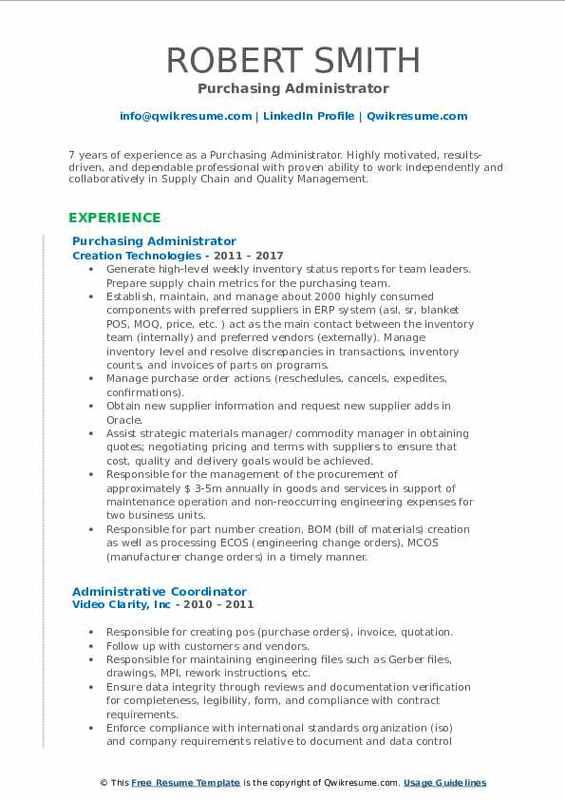 Summary : 10+ years of experience as a Purchasing Administrator is now seeking a position where my numerous professional skills surrounding purchasing and procurement will be utilized and expanded upon. Skills : SAP, MS Excel, PowerPoint, Access, Outlook, HTML, Forgen, Impact III/Skynet/Teleview, Brio, IDOCs, AutoCAD, Filemaker software, Lotus Notes, JBA, AS400, ACE tools, 7S procedures Strong MRP, ERP, And DRP Skills. Procuring, expedite and schedule deliveries of materials and services to the job site. Negotiating pricing and contract terms and conditions with subcontractors and suppliers. Leading formal negotiations (price, schedule, and supplier exceptions) to contractual requirements. Issuing purchase orders for procurement and expedition of materials and equipment for jobs. Increasing purchasing proficiencies by reviewing requisitions for clarity, compliance, detail and obtained additional information when necessary. Establishing new relationships with subcontractors and suppliers to ensure adequate resources for all projects and to continually improve pricing and quality of work. Developing contracting strategies to best support customer requirements consistent with project and company goals and objectives. Leading regular supplier and subcontractor performance reviews and defined relevant metrics consisting of technical, quality, cost and schedule requirements that maintained or helped increase customer satisfaction while building a strong supplier relationship. Objective : 3+ years of experience as a Purchasing Administrator is seeking a challenging purchasing related position with your firm where my skills can be effectively utilized and where opportunities for growth are available. Skills : Procurement, Word, Excel, Outlook, Sourcing, Procurement, Data Entry, Filing, Records Management, And Organizational. Responsible for the plant planning and procurement activities at the Nekoosa site. This includes raw material planning, inventory management, purchasing, and vendor management, through the entire life cycle including system accuracy. Managing out-sourced processes, ensuring efficiency of the flow of process and information accuracy in the system. Purchasing raw materials and packaging in the correct amounts to ensure inventory is maintained to the optimum level to support production while achieving annual working capital improvement goals. Drive purchasing effectiveness efficiency projects. Managing the system receiving process to ensure the accuracy of paperwork, timeliness of receipts, and reconciliation of any discrepancies, serving as a liaison for both operations and finance. Monitoring shipments to ensure that goods come in on time, and in the event of problems, trace shipments follow up undelivered goods and communicate information daily to operations. Serving as the liaison for any supplier quality issues, adhering to product quality standards and driving corrective action response and resolution from the supplier. Analyzing and research to determine best suppliers in compliance with supplier scorecard, presenting an annual update on supplier ratings and results. Communicating monthly pricing trend report to operations and sales to ensure clear visibility and understanding of raw material pricing. Evaluating and monitoring contract performance to ensure compliance with contractual obligations and to determine the need for changes. Supporting product development by sourcing raw materials, supply cost, vendor research, And certifications requirements. 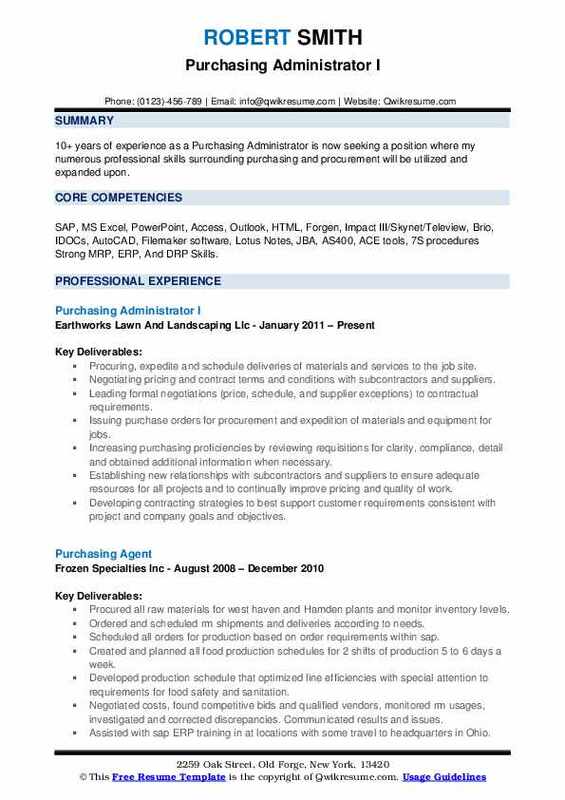 Summary : 7 years of experience as a Purchasing Administrator. Highly motivated, results-driven, and dependable professional with proven ability to work independently and collaboratively in Supply Chain and Quality Management. Skills : Applications Oracle, Microsoft Office (Excel, Word, PowerPoint, Visio, Outlook, Lync), Expandable, Agile, Omnify, PcMRP, Haven, HavenPro, QuickBooks, Lean And 5S+1, ISO 9001 Internal Audit. Languages English, And Vietnamese. Generate high-level weekly inventory status reports for team leaders. Prepare supply chain metrics for the purchasing team. Establish, maintain, and manage about 2000 highly consumed components with preferred suppliers in ERP system (asl, sr, blanket POS, MOQ, price, etc. ) act as the main contact between the inventory team (internally) and preferred vendors (externally). Manage inventory level and resolve discrepancies in transactions, inventory counts, and invoices of parts on programs. Manage purchase order actions (reschedules, cancels, expedites, confirmations). Obtain new supplier information and request new supplier adds in Oracle. Assist strategic materials manager/ commodity manager in obtaining quotes; negotiating pricing and terms with suppliers to ensure that cost, quality and delivery goals would be achieved. Responsible for the management of the procurement of approximately $ 3-5m annually in goods and services in support of maintenance operation and non-reoccurring engineering expenses for two business units. Responsible for part number creation, BOM (bill of materials) creation as well as processing ECOS (engineering change orders), MCOS (manufacturer change orders) in a timely manner. Headline : 5 years of experience as a Purchasing Administrator. I have extensive, senior administrative, office management and procurement experience. I am customer service driven, detail oriented and have the best work ethic I've seen. Skills : Word, Excel, Outlook, Sourcing, Procurement, Data Entry, Filing, Records Management, Organizational, Supplier Management, Powerpoint, EDI, Teamwork, Reports, Purchasing, Accounts Payable, And Networking. Assisted in the developing and organizing of procurement and contract documents (i.e., Scope of work statements, boilerplates, addenda, contract modifications). Working knowledge of the federal acquisition regulations (FAR), system for award management (SAM), excluded parties list system (EPLS), request for proposals (RFP). Ensure the lowest quotes are utilized for the purchase of materials, equipment, and services for bids. Administration of procurements that required sealed bids or competitive negotiation. Analyzed solicitations, advertisements, determined pre-qualification, reps and certs, contract amendments, contract closeouts, option years, in addition to the review of bids, proposals and bid tabulations. Maintain procurement reports (i.e., DBE/MBE subcontractor utilization; insurance requirements; contract renewals, contractors’ licenses, bonds certifications). Utilized the purchasing module of the financial management system (FMS) to prepare requisitions and purchase orders, while monitoring purchasing requests for all departments. Coordinated with senior management to resolve invoice issues as required, while interacting with originating departments to ensure that goods and/or services met with their requests. Provided continuous effort to improve procurement operations, streamline work processes and work cooperatively and jointly with a client to provide quality customer service. Negotiate for the best purchasing package (in terms of quality, price, term, delivery, and service) with suppliers and coordinate with suppliers to ensure an on-time delivery process for contracts were in compliant with federal regulations. 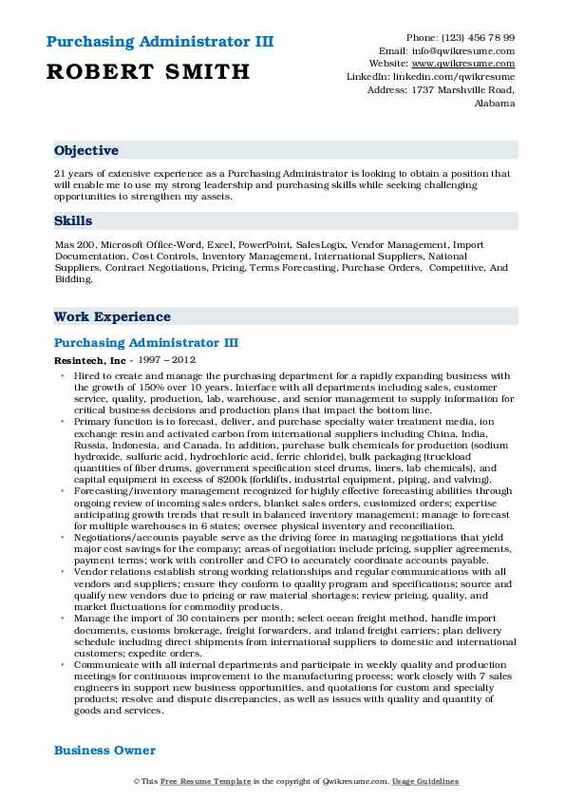 Summary : 21 years of extensive experience as a Purchasing Administrator is looking to obtain a position that will enable me to use my strong leadership and purchasing skills while seeking challenging opportunities to strengthen my assets. Skills : Mas 200, Microsoft Office-Word, Excel, PowerPoint, SalesLogix, Vendor Management, Import Documentation, Cost Controls, Inventory Management, International Suppliers, National Suppliers, Contract Negotiations, Pricing, Terms Forecasting, Purchase Orders, Competitive, And Bidding. 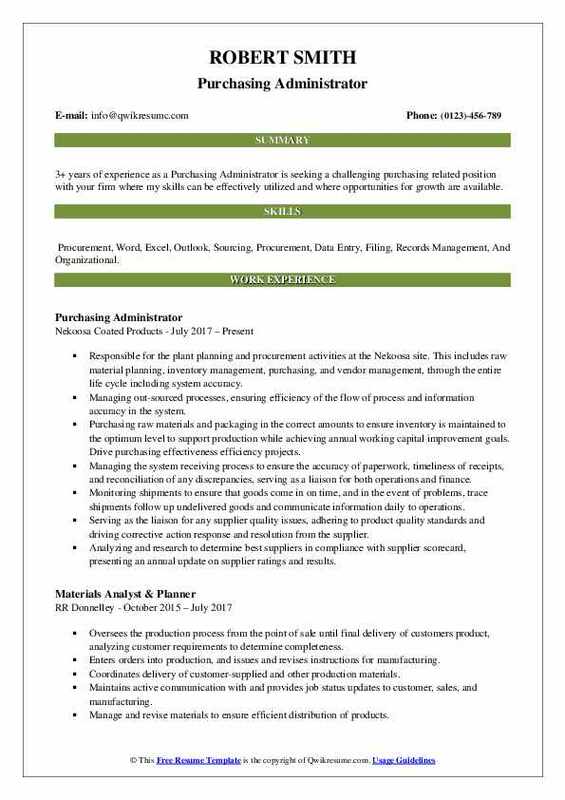 Hired to create and manage the purchasing department for a rapidly expanding business with the growth of 150% over 10 years. Interface with all departments including sales, customer service, quality, production, lab, warehouse, and senior management to supply information for critical business decisions and production plans that impact the bottom line. Primary function is to forecast, deliver, and purchase specialty water treatment media, ion exchange resin and activated carbon from international suppliers including China, India, Russia, Indonesia, and Canada. In addition, purchase bulk chemicals for production (sodium hydroxide, sulfuric acid, hydrochloric acid, ferric chloride), bulk packaging (truckload quantities of fiber drums, government specification steel drums, liners, lab chemicals), and capital equipment in excess of $200k (forklifts, industrial equipment, piping, and valving). Forecasting/inventory management: recognized for highly effective forecasting abilities through ongoing review of incoming sales orders, blanket sales orders, customized orders; expertise anticipating growth trends that result in balanced inventory management; manage to forecast for multiple warehouses in 6 states; oversee physical inventory and reconciliation. Negotiations/accounts payable: serve as the driving force in managing negotiations that yield major cost savings for the company; areas of negotiation include pricing, supplier agreements, payment terms; work with controller and CFO to accurately coordinate accounts payable. Vendor relations: establish strong working relationships and regular communications with all vendors and suppliers; ensure they conform to quality program and specifications; source and qualify new vendors due to pricing or raw material shortages; review pricing, quality, and market fluctuations for commodity products. Manage the import of 30 containers per month; select ocean freight method, handle import documents, customs brokerage, freight forwarders, and inland freight carriers; plan delivery schedule including direct shipments from international suppliers to domestic and international customers; expedite orders. Communicate with all internal departments and participate in weekly quality and production meetings for continuous improvement to the manufacturing process; work closely with 7 sales engineers in support new business opportunities, and quotations for custom and specialty products; resolve and dispute discrepancies, as well as issues with quality and quantity of goods and services. 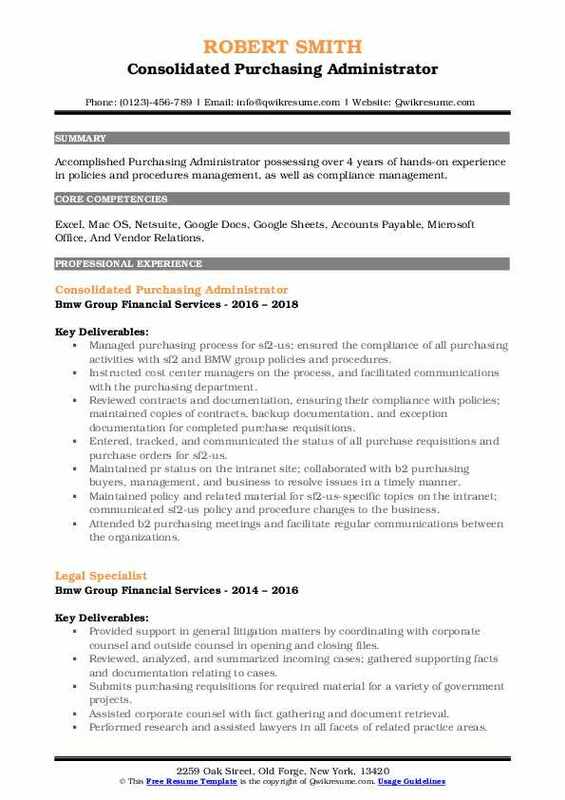 Summary : A highly motivated Purchasing Representative with 15+ years of purchasing, customer service, and account management experience, supporting executives, doctors, and clinical staff with their purchasing needs. A team player that is reliable, hard-working works well under pressure, with minimum supervision with an uncompromising work ethic. Skills : Analytical Skill, Detailed-oriented, Meet Deadlines, Handle Multiple Tasks Simultaneously, Works Effectively, Independently, Excellent Communication, Interpersonal, Strong Organization, And Time-management. Coordinating system updates, assisting in the administration of special projects, assure requirements and job responsibilities are complete and performed in a professional and timely manner. Management and reporting of the supplier diversity program, including attendance at all required conventions and seminars. Conduct audits of documented purchasing processes and address any findings. Audit and review vendor compliance with executed pricing agreements and address any findings. Assure vendor acknowledgments are appropriately executed and received regarding compliance with company policies pertaining to safety, PPE and purchase order terms and conditions, FCPA, etc. A document, maintain, distribute and file all policies, procedures, official forms, and flowcharts for the purchasing department. Assist in maintaining, tracking and meeting departmental goals and objectives. Certain other administrative duties as directed by the purchasing director and including, but not limited to, generating reports and presentations, filing documents, and answering telephones. Provide analytical and informational support to other departments, as needed. Objective : Accomplished Purchasing Administrator possessing over 4 years of hands-on experience in policies and procedures management, as well as compliance management. 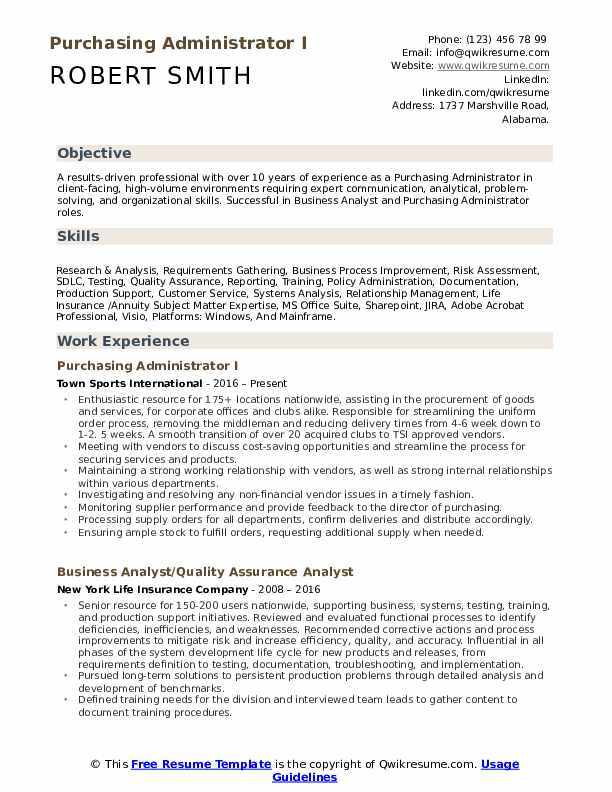 Skills : Excel, Mac OS, Netsuite, Google Docs, Google Sheets, Accounts Payable, Microsoft Office, And Vendor Relations. Managed purchasing process for sf2-us; ensured the compliance of all purchasing activities with sf2 and BMW group policies and procedures. Instructed cost center managers on the process, and facilitated communications with the purchasing department. Reviewed contracts and documentation, ensuring their compliance with policies; maintained copies of contracts, backup documentation, and exception documentation for completed purchase requisitions. Entered, tracked, and communicated the status of all purchase requisitions and purchase orders for sf2-us. Maintained pr status on the intranet site; collaborated with b2 purchasing buyers, management, and business to resolve issues in a timely manner. Maintained policy and related material for sf2-us-specific topics on the intranet; communicated sf2-us policy and procedure changes to the business. Attended b2 purchasing meetings and facilitate regular communications between the organizations. Worked on the performance of activities and interaction with both internal and external customers. Reported on purchasing statistics ad-hoc; assisted in the coordination of the year-end accrual process. Objective : T4+ years of experience as a Purchasing Administrator is now seeking to work for an organization that will utilize my skills, abilities, and education, and allow me to make a significant contribution, and optimize performance. Skills : MS Project, MS Visio, Sharepoint, Internet Explorer, Firefox, Chrome Google, Outlook, Outlook Express, PowerPoint, And Adobe Photoshop. Responsible for receiving and processing the service orders in the relevant systems and ensuring seamless coordination between sales, purchase, field service and business unit in the execution of the service jobs. Coordinating with the field service coordinators and sales managers to ensure all customer purchase orders are placed onto relevant systems on time and being responsible for them from start to finish. Placing the purchase order for the spare parts for service jobs, service orders, inventory stock items etc. Updating records to ensure all safety passes are renewed on time for all service personnel. Monthly opening and closing of projects in the ERP system including data entry for budgeting and cost control. Assisting in preparation of invoices for the orders from the marine division. Cost control - ensure that costs are registered in the ERP system, and incorporated in invoicing. Administration of orders - ensure that the project files are up to date and accurate (online and hard copy). Summary : Purchasing professional with more than 9 years of varied procurement experience. Dedicated to cost-effective strategies through early supplier involvement and negotiation. Ability to maintain tight controls over numerous projects with strong goal orientation. An energetic, innovative team player that works well under-pressure and produces results. 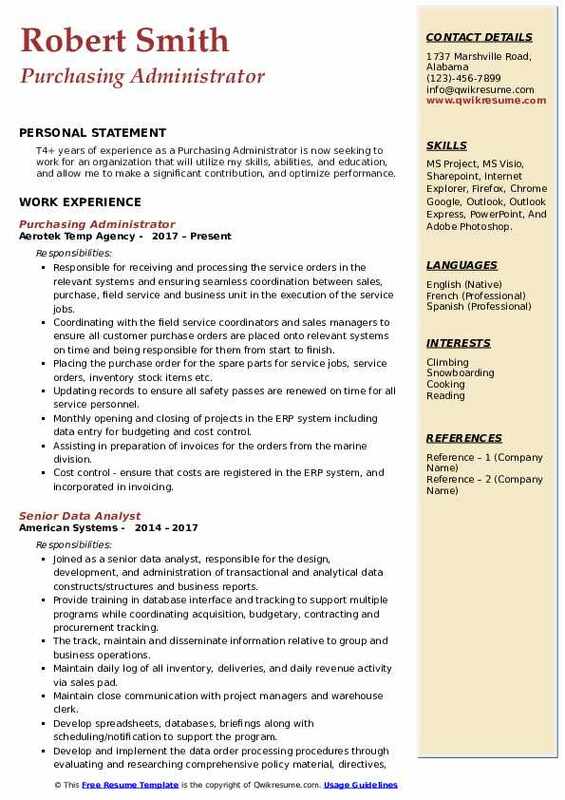 Skills : Purchasing, Effective Negotiating, Customer Service, Inventory Management, Licensing And Software Management, Vendor Relations, SAP MAS200 ERP, Microsoft Office Proficiency, And Computer Hardware. Responsible for the procurement of computer software and hardware, telecom, and services in support of company project initiatives and ongoing requirements, in accordance with the terms and conditions established in negotiated purchase agreements. Collaborated with project management teams, internal lines of business, and field employees to clearly establish requirements including price, quality, and delivery parameters and negotiates contracts including price, delivery, terms, and conditions with vendors. Monitored and followed-up with vendors to ensure compliance with schedules and requestor requirements and to coordinate resolution of delays or problems that arise. Train and provide "how-to" assistance and problem resolution support regarding hardware and software standards and general procurement procedures and policies. Communicated statuses with it project teams on all submitted service request. Member of the sap super user community assisting in developing and implementing sap into the enterprise. Wrote and implemented the "policies and procedures" for it purchasing.